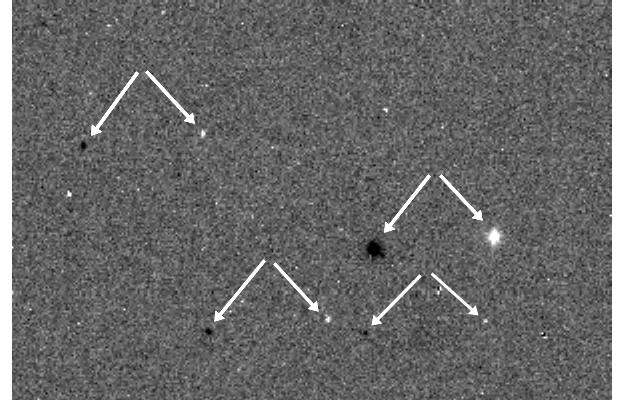 The first image taken by the Trace Gas Orbiter of the ESA–Roscosmos ExoMars 2016 mission. The image was taken by the Colour and Stereo Surface Imaging System, CaSSIS, and points to a randomly selected portion of the sky close to the southern celestial pole. The picture shows the result of taking one CaSSIS frame, turning the camera's rotation mechanism, and then taking another. 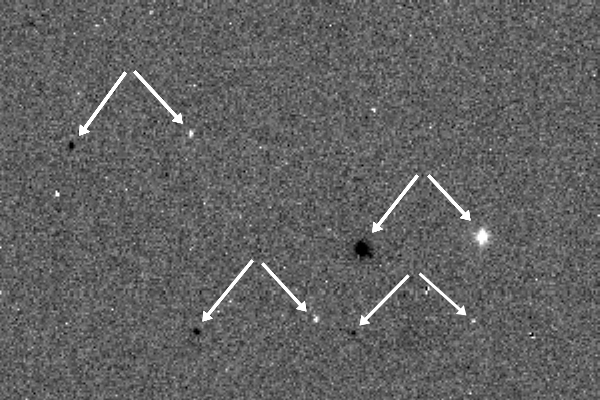 By subtracting the two frames, a series of bright and dark spots are seen, all equally offset from each other, demonstrating that these are positive and negative images of the same stars. The field-of-view is 0.2° in the horizontal direction, and is a subset of a larger image, extracted for this purpose to show the stars at a reasonable size. In operation at Mars, about 400 km above the planet, CaSSIS will sweep out a swath as TGO approaches it, then turn the rotation mechanism by 180° and image the same swath as it recedes. By doing so, CaSSIS will make stereo images of the surface.